The mining industry is very demanding on gearing. Gear Motions has the gear production capabilities, equipment and experienced team to produce heavy-duty, durable gears to meet industry demands. Our large, coarse pitch gears are used in equipment for power generation and industrial coal processing. 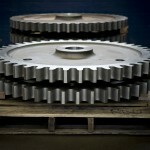 Gear Motions is an experienced gear manufacturer with proven performance in product and service. You can feel confident turning to us for heavy-duty gears for mining applications. Contact us for a quote today!